"The Offering" *images are copyrighted and may not be reproduced without the written permission of the artist. 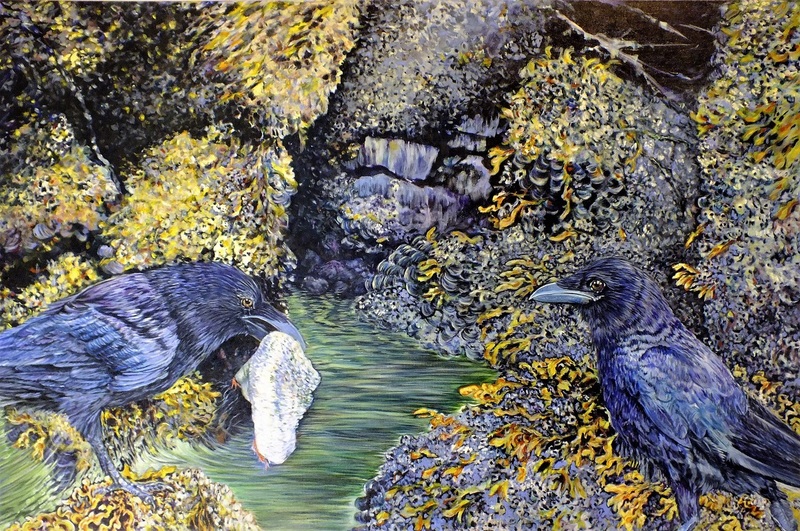 Originally from the Okanagan, Ucluelet artist Shannon McWhinney’s work is a rich combination of layered pencil crayon techniques, watercolour, acrylic as well as oils. Her work focuses on the west coast; its energy, seascapes, wildlife, myths and culture. Shannon’s recent work explores how reflections and currents transform wildlife and landscapes. These artworks can at times become Surreal impressions and are primarily acrylic and oil on canvas. She also blends female imagery with marine elements to create surreal beauties. Shannon has degrees in Fine Arts & Art Education; she has completed a number of commissioned artworks and has exhibited her work in the Okanagan, Ucluelet and Tofino. She is represented by the Reflecting Spirit Gallery #8 - 1620 Penninsula Rd. in Davison Plaza, Ucluelet BC *images are copyrighted and may not be reproduced without the written permission of the artist.